Aguila (Spanish for “Eagle”) is a brand by Industrias Tecnos, a sporting and rimfire ammunition manufacturer established by Remington Arms in Cuernavaca, Mexico. Remington’s experts themselves trained their staff, so they carry on that tradition of excellence. 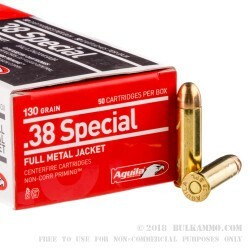 Industrias Tecnos supplies ammunition to the Mexican military, but they will also supply it to you, as they do with this high quality 38 Special cartridge. 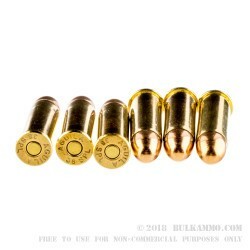 This cartridge’s 130 grain bullet sports a copper full metal jacket over its lead core, so it won’t foul your firearm’s bore during a lengthy session at the range. It further offers a muzzle velocity of 900 fps. 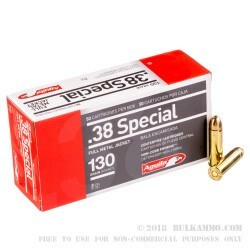 The 38 Special is a popular cartridge with handloaders, and with this round’s non-corrosive and Boxer primed brass case, it’s prime for reloading again and again. 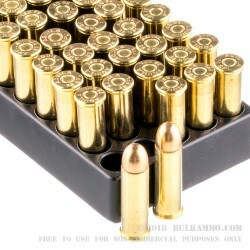 Whether you handload or not, firing 50 of these for fun or self-defense training will go by so quickly that you may want to pick up a few boxes.